Are These Chameleons In Our Skies? 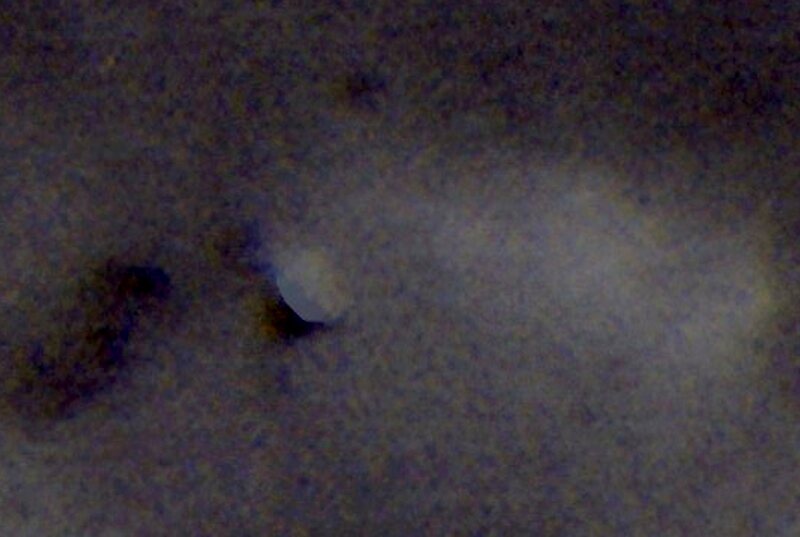 The object depicted in the above photo was taken by Jim Kerr in late 2013. 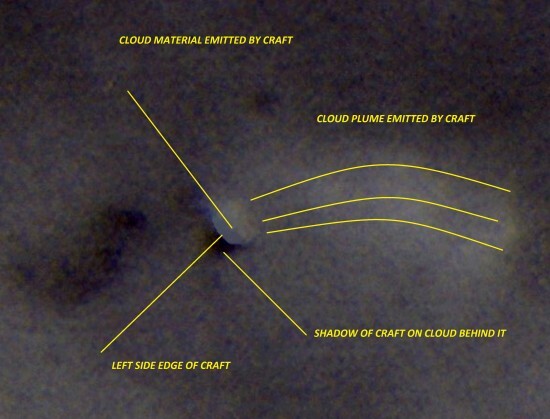 This object meets the profile of these alleged cloaked cloud craft as they appear to emit a cloud-like material. I captured this using a Nikon F4s 35mm SLR using B&W film with a near infrared filter attached to the lens. 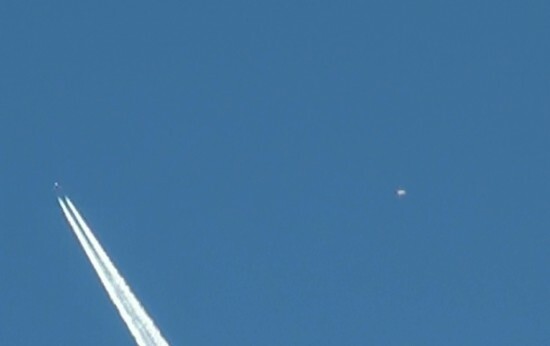 In the above photo I point out the alleged craft and the left edge. 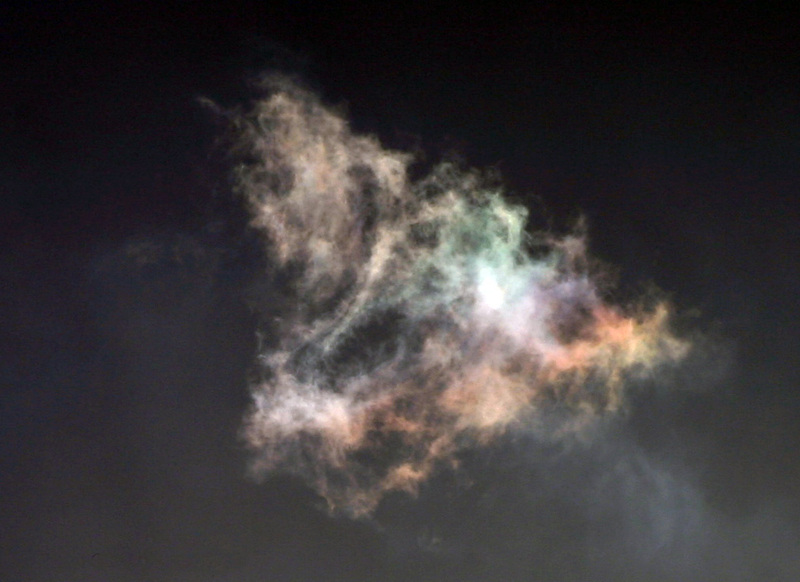 The shadow the object is casting on the clouds behind it and the coud-likeke material plume being emitted from this object. Still removed from full spectrum video footage. This is a still removed from full spectrum video footage (Below). 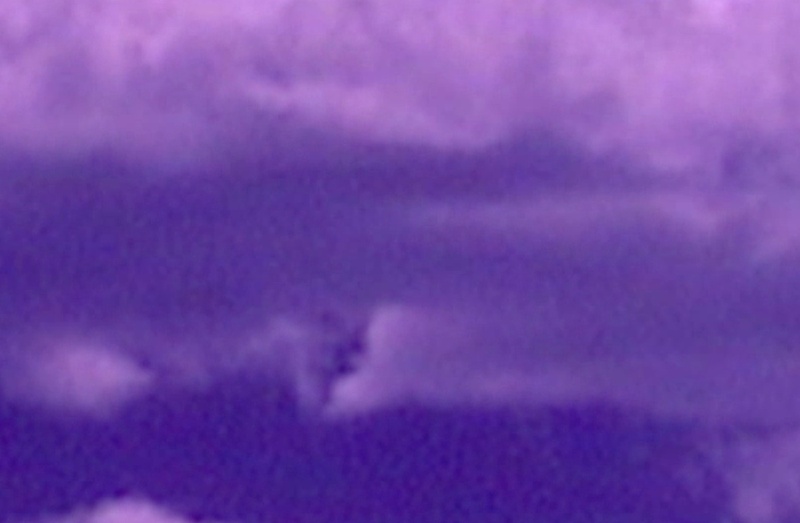 I filmed this object gliding along the bottom of this cloud. Notice the triangular shape and what resembles two engines or ports at the rear of the object. Also notice the wake of cloud material that clings to the rear of the object as it traveled from right to left. 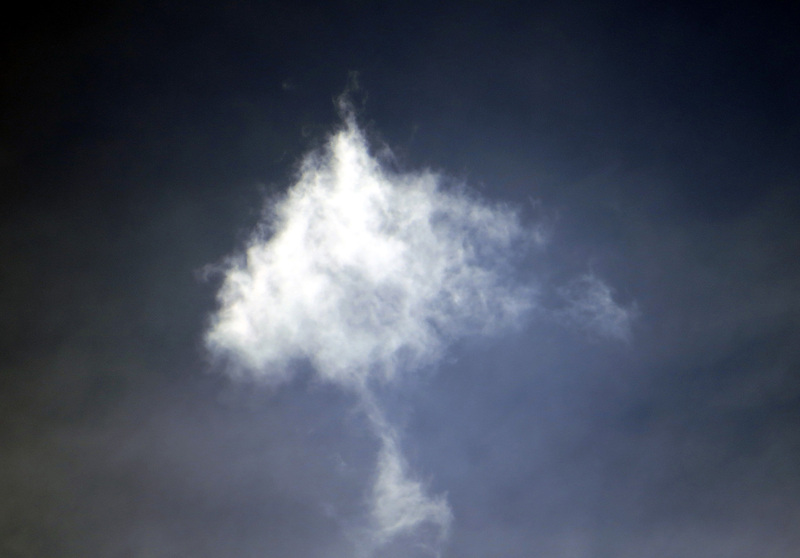 It made a sharp turn upward and vanished into the cloud. The video below was filmed by Jim Kerr on April 20 2013. 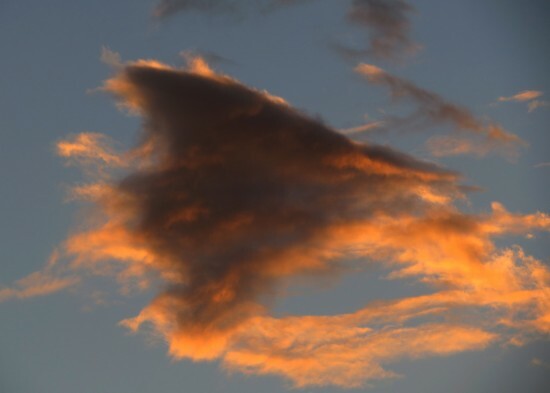 Early in 2012, I began noticing strange anomalies in and around bizarre looking cloud formations that just didn’t seem like they belonged in the sky. I soon came to the “insane opinion” that a few of these anomalies in and around these clouds resembled triangular objects of various sizes that were emitting some type of cloud like material and interacting with Chemtrail aerosol spray. The signatures or footprint of these objects could be seen but I could not see anything that looked like a solid object. On a number of occasions, I observed aircraft traveling through these objects revealing they were not solid objects. The bottom line is, this is unknown territory and further observations and documentation are needed. 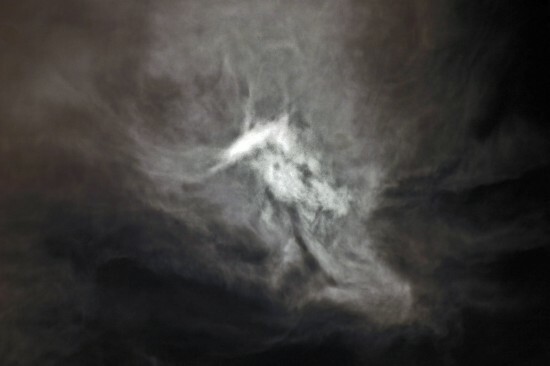 Sean Gautreaux is an author, artist, and researcher of this subject of Cloaked Cloud Craft. Check out his website listed below and decide for yourself if these objects are real. “We are inching towards the answers. Then we have to learn how to get our minds to deal with something colossal and unfathomable . There will be no going back ,once we know the answers”. “You know I never see anything normal up there, but this one bugged me for ages. Unusual angle ,looking down on it as opposed to looking up at it. Maybe there is something about this atmosphere ( on an atomic level ) that we have never been privvy to ,yes it makes you wonder what they consist of”. “Which is why it is probable that MOST of the Clouds we see are NOT Clouds in the traditional sense. This is why they no longer look like the Clouds when we were small. Gradually the old style Clouds have been infiltrated by these things”. “The first step is always the hardest and people know this area is well out of their comfort zone. This is also something else that once you start ,there is no going back. We cannot un-know these things. 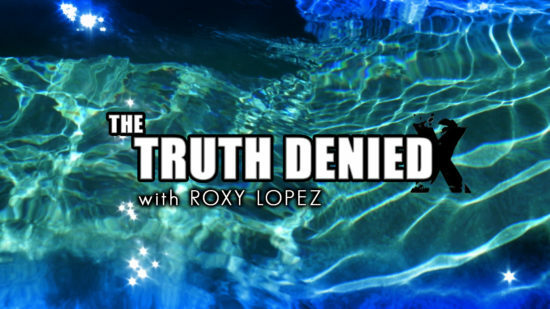 Hats off to Roxy Lopez” ! I find this subject of Cloaked Cloud Craft fascinating and have seen the footprint of these object many times. I do not believe these are solid objects nor do I believe these are alien or an extraterrestrial technology. 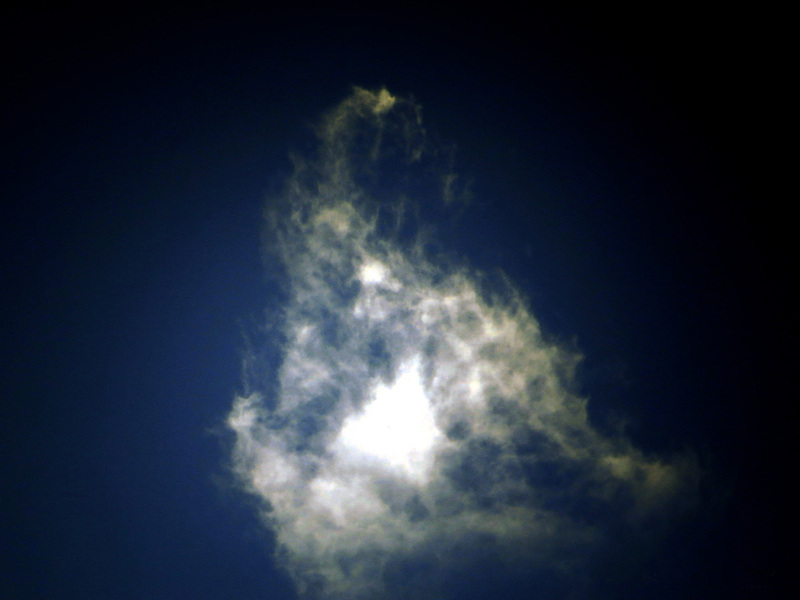 I also believe many of these captures are simply natural cloud formations but some are suspecious. I have now come to the opinion that good captures of these objects may have something to do with military technology involving HAARP patents. 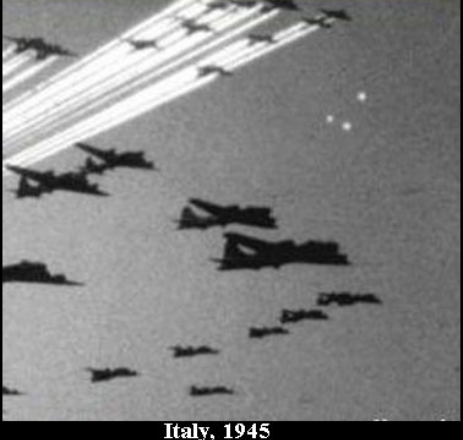 I have observed a connection to aerial spraying known as chemtrails and these objects. I have observed unmarked tanker jets target these alleged cloaked cloud craft with short bursts of an unknown aerosol spray causing a change in the appearance of these objects. It is possible there is a connection to the Naval Research Labs Plasma Cloud technology. More research is needed on this subject connecting the dots to the limited publizied military documents. Here is a interesting article with video of technology used in custom paint jobs for custom automobiles. One of our theories regarding the cloaking technology used in these craft is in the paint applied to them. Electrified computer controlled paint could render these craft invisible and with computer technology they could be camouflaged to match the surrounding sky. Just think, if this technology is being applied to cars, how advanced is this technology for the black budget aviation programs. In the article it states this paint has a life span of approx 10,000 hours. I find this quite interesting as I was told by a source that some top secrete craft need to be repainted frequently. Again I remember the statement told to me, “What we have is beyond science fiction”. “New stealth technology makes airplanes invisible not only to radar, it renders them hidden to the human eye as well – just like an invisibility cloak in a Hollywood sci-fi thriller”. Remember the technology is far more advanced than they will admit. “In his testimony, you will learn that the US not only has operational antigravity propulsion devices, but we have had them for many, many years and they have been developed through the study, in part, of extraterrestrial vehicles over the past fifty years”. EXAMPLE OF LIGHT BENDING TECHNOLOGY TO RENDER A OBJECT OR PERSON INVISIBLE. Here is a good clue…This could be one of the reasons that only the outline of these craft are visible. “Not 100% invisible. The outline can be seen by the naked eye”. Jim Kerr is a retired police officer with an extensive background in criminal investigations. In 2011, Jim took and interest in Chemtrails / Geoengineering and began filming and documenting the skies over the Antelope Valley California in hopes of spreading awareness to this agenda. 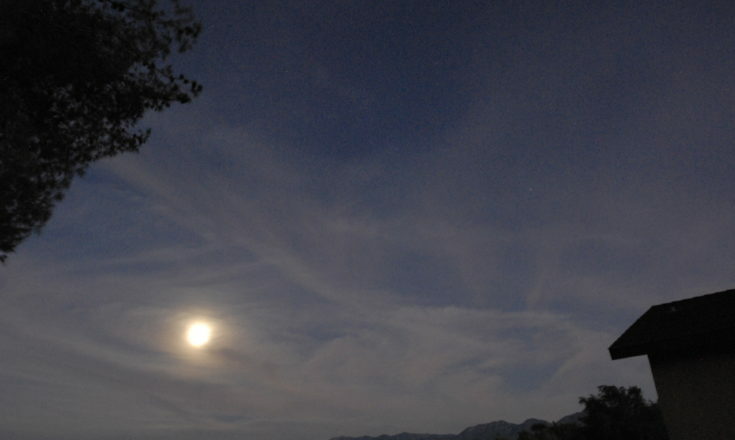 Within a short time Jim began capturing strange anomalies in the sky that appeared to have a connection to Chemtrails. Anomalies consisted of obvious man made plasma cloud experiments connected to HAARP type technology for weather control and other military applications, UFO’s than have a strange attraction to chemtrails, Cloaked Cloud Craft that use a technology to render themselves almost invisible but do have their glitches. Jim shares his finding with many researchers worldwide to collectively reveal the truth. Thank you for your comment. There are so many clues about what is truly taking place within the dark black ops military programs and is unbelievable to most. But by connecting the dots we can surly have some insight. China Lake is a hot spot. TERRAFORMING,interesting word,reducing the oxygen content of the air,……I hate to be the bearer of bad news,BUT YOUR PLANET HAS BEEN SOLD,and they need the oxygen level to come down a lot to live here,PLANET earth will be mined by the survivors,AS SLAVES.,…..LET me give all you guys a PIECE OF ADVICE,stay under the PROTECTIVE WING,of OUR DEAR LORD,and his guardian ANGELS,cause if you don’t,I guarantee you wished you had,and “DON’T” go anywhere without you best BATTLE RIFLE with you at all times,its about to get real here shortly……….. There may indeed be off worlders flying around our skies. But with today’s imaging technology, if you believe a picture, you’re an idiot. Of course with today’s imaging and editing technology anyone can show any contrived hoax in video and photos. Most of what is on the internet is contrived and that is a shame. But what about, lets say, the 10% that are real unexplained captures of aerial phenomena and these objects can be connected to know advanced technologies and applications. Makes one think doesn’t it. Here at The Truth Denied we don’t need to post any contrived photos and videos. We have experts who have the experience and technology to analyze footage. We have a track record of knowing the source and integrity of those who work with us providing video and photos. Thank you for your comment. We live off the oxygen so if they bring the oxygen level down to meet their needs, how would we survive to become slaves for them? Terraforming the planet has nothing to do with the reduction in oxygen on the planet, however deforestation absolutely is a threat to the oxygen. I don’t know that extraterrestials need less oxygen at all….. Thank you for your comment and awareness. There is a growing awareness taking place worldwide to what is taking place and we still have many unanswered questions. You can contact me by email at chemtrailsavca@msn.com. I would defiantly like to hear your findings. I live on the big island of Hawaii and I’ve noticed them for the past two days straight. Today there are at least 6 but probably more. Why are they watching us and when does the watching stop and become something more? It’s exciting, interesting, and very heeby jeeby. I’ve got photos if u care to see them. I am from the BI and would love to see your photos! i just noticed the same cloud seen hANGING IN FRONT window facing westerly SINCE IN ARRIVED (BEEN THERE FOR SEVERAL DAYS) NOW GONE. MEMORY SERVES me it held the same pattern for about 4 days and disappeared. Interestingly weird if nothing else. wish I was aware of this earlier so could have tken pictures. next time. Thank you Sonny for your comment and relating your observations. In the world of ufology there are many bizarre phenomena taking place in our skies that we can not fully explain. Please forward photos in the future to us at “The Truth Denied”. While taking photos make sure you take the photos outside rather than through a window. Taking photos through a window can cause reflections and inaccuracies. Sincerely, Jim. Sonny do you have any photos of the cloud please (And could you take one photo of the “cloud” daily for threee days in a row t the same time? Would you be willing to do this? umm looking down on these lines myself after making a fool of myself, accusing everyone of a cover up when they actually were never aware of the future visiting our nuclear establishments but to what end, if they cant and won’t believe this is happening, then we will never know why they came back,but only the future would know how to come back cloaked from our security devises.they came here for a reason? they allowed my wife and I to witness there presence,why?BIG WHY? Id say about two years ago i was at my poolside talking religon with my wife! It was a perfect clear sunny blue sky day. I mean not a cloud in the sky! Well maybe just 1… My wife told me to look at the one tiny cloud about 500 feet up and maybe 35 feet to the south of our pool! It was setting perfectly still with what i would say a jelly fish look to it! 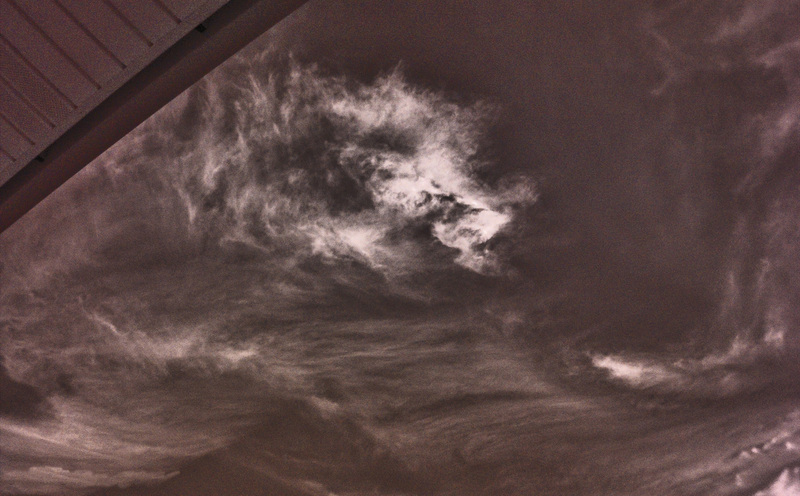 What i mean is what a jelly fish would look like swimming above you except in a cloud form! 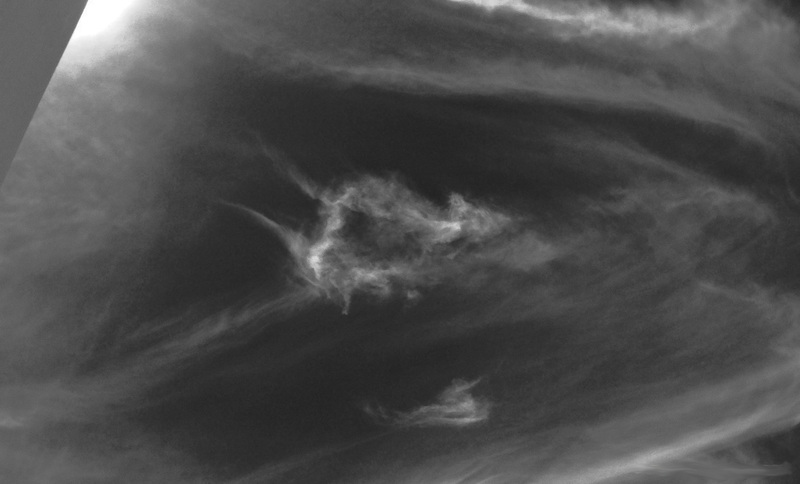 We noticed no noise and an almost holographic look to the cloud. I became excited and told my kid to run in and get my Binoculars. As soon as i mentioned binoculars the cloud in a jellyfish holographic movement started moving at a slow steady speed to the north east! I live 40 miles south of chicago in northwest indiana. Because i also research the ancient text i concure there are no aliens and this is dimensional beings(fallen) we are dealing with! Because i was talking religon with my wife i felt at the time it was some sort of portal opened up. But i also believe it was most likely a military antigravity craft being controlled by men 19 to 35! My deduction? Well it was the weekend and they were hovering over my pool! My wife was in a Bikini and my 14 year old daughter was too! I do know fallen angels are attracted to woman(gen ch.6) but the most logical conclusion is humans using the technology and taking a little detour! I have over 6,000 cloud pics I’ve taken over a year and a half here in Oregon. I also have several lights that fly in at dusk every night. Which I also have some grainy but visible video of. I’ve never been able to figure out what to do or who to show these too. Most people just brush it off as my imagination. Really enjoyed this update, is there any way I can get an alert email every time you make a new post?